Stokes tallied 32 points and nabbed 20 rebounds in Rochester’s 100-98 loss to New York Saturday. On Sunday, he dropped to 17 points but again collared 20 rebounds as the Royals handed the champion Syracuse Nationals a 83-80 defeat. Maurice Stokes was not the first black player in the NBA. That honor belongs to Earl Lloyd in 1950 Nor was Stokes the first selected at a lofty draft position. Ray Felix was taken #1 overall in 1953. Nor was he the first all-star. That would be Don Barksdale in the 1952-53 season. Maurice Stokes was simply the first black superstar in the NBA. Not just a really good or all-star caliber player, but one who truly shifted the fortunes of a franchise by himself and could alter the way the game as a whole was played. He wasn’t merely a player who did an established role particularly well, he expanded, fused and created new roles for his position (power forward) in ways that still have been mastered by only a few players. Stokes had Dayton on the ropes throughout, totaling 43 points and playing like a man and a half under the boards and on defense. If he doesn’t get the nod as the most valuable player in the tournament, it’s time for another investigation of college basketball. Maurice grew up poor in Pittsburgh. His parents worked at the steel mills and he spent much of his time on the basketball courts with his friend Ed Fleming. Together they led their high school, Westinghouse to the city championship in 1951. Despite that notable accomplishment, Stokes went largely unrecruited when he graduated high school, eventually accepting an offer from Saint Francis University in tiny Loretto, Pennsylvania. By the time he graduated four years later, Stokes had gone from unknown to coveted commodity after averaging 22 points and 24 rebounds. 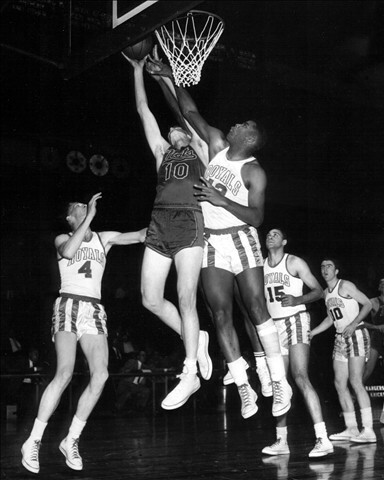 Due to Stokes’s dominant play, the unknown and unranked Frankies would appear in back-to-back NIT tournaments in 1954 and 1955 in New York City. On basketball’s biggest stage, Madison Square Garden, Stokes finished as the runner-up for MVP in ’54 and won the award in ’55 for the NIT despite St. Francis not winning the tournament either year. In the 1955 NBA Draft, Maurice was taken second overall by the Rochester Royals. A perennial stalwart first in the National Basketball League (NBL) and then in the NBA, the Royals had been led for a decade by point guard Bob Davies. These glory years included two titles (NBL in 1946, NBA in 1951) and an NBL MVP award for Davies in 1947. They were the only team to beat George Mikan’s vaunted Minneapolis Lakers in a playoff series during that Minnesota dynasty. Davies, though, had retired after the 1954-55 season and not much talent was left. Bobby Wanzer, once a great player in his own right, was now 34 and serving as player-coach. The 1955 draft helped to re-arm the Royals. There was Maurice, of course, but also his old high school teammate Ed Fleming was taken, as was another Pittsburgh native, Jack Twyman. But Maurice was the major haul and he stormed the NBA. Never before had the professional league seen such a big and powerful man, 6’7″, 250 lbs, operate with such agility and speed. Power forwards usually stuck to their forceful nomenclature and banged down low. Stokes surely accomplished that aspect. In his three NBA seasons he averaged 16.3 then 17.4 and finally 18.1 rebounds a game. He led the league in RPG his rookie season and finished second to Bill Russell in his final two years. As for the speed and agility, Stokes could take off down court once he had nabbed a rebound, or do a fabulous outlet pass to a guard. But outlet passes didn’t catch people’s imagination like a 250 lbs power forward leading a fastbreak. That still rarely happens. The closest things to it have been Magic Johnson, Charles Barkley, and LeBron James. While leading this break, Stokes could finish it himself along the lines of LeBron James, or he could dish it off along the lines of Magic Johnson. Stokes was the first truly great passing big man the NBA had seen and thus creating the point forward spot. His assist averages were 4.9, 4.6 and a startling 6.4. Today these gaudy assist numbers for a power forward are eye-popping, but consider this was back in the 1950s and assists didn’t come cheap. In fact, Stokes finished 8th his rookie year in APG and then had back-to-back 3rd place finishes in 1957 and 1958. Stokes’ passing was a damn good thing, because Rochester did not have a point guard to assume the mantle left by Bob Davies. Stokes’ presence kept the Royals average and instead of sinking into a terrible abyss. However, with the expanding costs of operating an NBA franchise due to traveling regularly to the far away Minneapolis and St. Louis, Rochester could no longer afford to keep the Royals and the team decamped in 1957 for Cincinnati. After having missed the playoffs by just 2 and 3 games the previous two seasons, the Royals were finally going to make the postseason in 1958 behind their powerful, hall of fame frontcourt trio of Stokes; Jack Twyman who was by now blossoming into a terrific small forward with a deadly shot; and center Clyde Lovellette with some of the meanest elbows the NBA has ever seen. Elsewhere the roster was still paper thin. Their first round opponent would be the Detroit Pistons, with whom they’d evenly split the 12-game regular season series. Back then, the first round was a best of 3 series and the Royals would be swept 2-0. Maurice, however, played in only one of the games totaling a sub-par 12 points, 15 rebounds and 2 assists. The underwhelming performance in Game 1, could be traced to the final game of the regular season. Playing the Lakers in Minneapolis, Maurice was knocked to the floor. Unfortunately, His head took the brunt of the fall and he went unconscious. True to the “tough” but medically unsound nature of the era, Stokes returned to the game after a few minutes and led the Royals to victory with 24 points. The head trauma didn’t dissipate, however. The Royals traveled by train to Detroit for Game 1 of the playoffs. The locomotive was a viable option since the Lakers game was on a Wednesday and the Detroit game on a Saturday. However, there was a quick turnaround from Game 1 of the playoffs to Game 2. The second game of the series was on Sunday in Cincinnati. There was no time for bus or train travel. The Royals took a plane and the change in atmospheric pressure debilitated an already weakening Stokes had been complaining of nausea since his fall in Minnesota. By the time the plane landed in Cincinnati, Stokes was unconscious, soaked in sweat and was immediately transported to a hospital. The fall and then the pressure changes of the plane flight had left Stokes’ brain permanently damaged from post-traumatic encephalopathy. Nearly his entire body was paralyzed, including much of his face. Stokes had made good money in the NBA, but “good money” in the NBA then wasn’t enough to cover his hospital expenses and the nascent players’ union had yet to win any pension or medical funds from the owners. Had it not been for his former playground buddy and now-teammate Jack Twyman, Maurice would have been helpless. Twyman, who would be the first player to average 30 points in a season and be inducted into the Hall of Fame, was made Stokes’s legal guardian. Twyman helped with Maurice’s medical bills, would help organize benefit games to raise money and successfully sued for workers compensation. Stokes would regain some of his faculties and would even visit one of the benefit games held in his honor with players like Wilt Chamberlain, Bill Russell, and Oscar Robertson greeting him. After a dozen years, Stokes passed away in 1970 from a heart attack as he worked tirelessly just to regain simple movements in his legs and hands. Maurice Stokes remains one of the more amazingly unique players the NBA has ever seen. The way he blended his size, strength and agility has been rarely duplicated. In his rookie season (1956), he finished in the top 10 in all three major statistical categories: points (10th), rebounds (1st) and assists (8th). For the next two seasons Stokes finished 2nd in rebounding and 3rd in assists each year. The only other player to replicate these achievements has been Wilt Chamberlain. You can’t help but wonder how the career of the NBA’s first black superstar would have turned out had his head not come crashing down on the Minneapolis court or had his injury subsequently been handled better. Had teams not scoffed at the notion of hiring full-time trainers as a cumbersome, unnecessary expense. Nonetheless his impact was felt. He was Rookie of the Year, a 3-time All-Star and a 3-time member of the All-NBA 2nd Team. Along with Bob Pettit, he helped make the power forward position more than just the spot where you stuck your flat-footed goons. With Bill Russell, he ushered in an era where rebounding was taken above the rim instead of just jostling for the spot where the ball was going to land. And alongside Elgin Baylor, he was able to combine power and finesse on the offensive end. Nearly 50 years after his last NBA game, Stokes was inducted to Hall of Fame thanks to tireless efforts of Twyman, Bob Pettit and Oscar Robertson to keep his candidacy and story alive. This Lowdown is certainly not the first or best recounting of Stokes’ career. Just another step in keeping his memory, and the lessons of his life, alive.